Integrate and come to be the perfect whole you were meant to be. Transmutate, subsume, clarify. Become the better of You ever en route. Transform to be your best version yet, and in the making. You have just begun. The pictures above pretty much sums up what happens through Maintenance Therapy. ​Maintenance Therapy helps maintain health. In a world where encroachment, 'energy vampires' and dysfunctional attachments are rampant, Meristem Intelligence® Maintenance Therapy helps to main a person being themselves without losing their essence or getting lost in the groups and crowds they come to be in the midst of living. Our bodies are like a machine. Just as a house needs regular maintenance to ensure smooth functioning, our bodies need maintenance too, but we are organic machines, not merely mechanically put together a set of tissues that happens to be moving. The essence of a person is like oil. Just as when you grind seeds its essence emerges as the essential oil of the seed, when you distill all that a person is to the basic essence, you get the self of the person as the essential 'oil.' The essential oil of a seed as its quintessence is what lubricates it from within. This essence within each of us is what makes us uniquely You versus me. Since people tend to grow in age and experience with each passing moment/day along with surviving through daily stresses, experiences of living precipitates and our essence gets polluted/diluted and clarity of who we are essentially becomes diminished. When this happens, we tend to get lost in the crowds having lost our essential sense of individuality and our ability to contribute as individuals responsibly gets diminished. With Meristem Intelligence® Maintenance Therapy, I help maintain that 'essential oil' that makes You You so that you could continue to function as the individual amongst the crowds without getting lost in it. With regular Maintenance sessions, your 'essential oil' gets detoxified and your life starts running on "well-oiled wheels." There is also something else that happens. 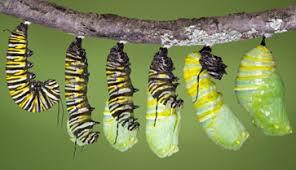 It is a phenomenon that I find can only be likened to the metamorphosis that a caterpillar goes through in becoming a butterfly in a process that has been summed up with the pictures above. 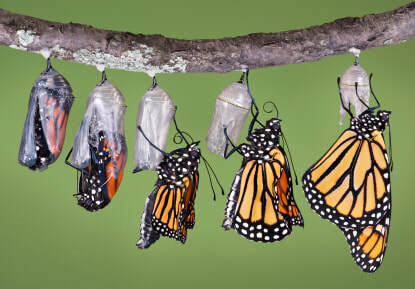 It is a metamorphosis that comes about when the essence of a person goes through refinement. Think of it like old wine that gets better with passing time. More/regular sessions, better You. You would come to be living essentially your best life being your best version. The difference is unmistakable. Every session is a phenomenon/event in a moment in time where clarity begins to dawn. No person has left a session without exclaiming to feel relaxed at the least. Some report having had a good sleep after a long time immediately after a session. Each session begins to clarify the muddy waters of a person and even a little clarification at a time makes a lot of difference over time in the physiological constitution of a person. The benefits of a session may seem to dissipate after a few days when people are back in the humdrum of everyday living but it is like a drop of clarifyier drippled into the muddy waters of a lake. The ripples form within and without whether a person is aware of it or not and that much degree of clarity remains. With regular sessions, the clarity enhances correspondingly and so does their emotional bandwidth and their usual irritatants starts to no longer be so much of an irritation. Life begins to become more tolerable. The level of tolerability continues to increase with further sessions until there is a qualitative difference in the nature of tolerance. There begins to be a meditative quality to everyday living, kind of like absorbed within and without in minding their own business of living their life. Almost like a modern day yogi. This is something that is to be experienced to understand. - Untangling of knots and confusion so that health emerges with an unprecedented vigor, presence and vitality. - Unbaggaging of difficult/distressing experiences so that the learnings from them emerges as the gift from having gone through such experiences. An ability to be living an 'and' life rather than a 'but' life. People actually emerge wiser from regular sessions for having gone through whatever they have gone through; that whatever life they have lived thus far becomes fuel/fodder for what they want to be doing. That their experiences add up as though a hidden treasure whose pearls of wisdom has been waiting dormant to be discovered. During sessions, these pearls of wisdom emerge into their consciousness, wealthifying them from within. - Energy batteries recharge. People tend to do better for longer without tiring out as easily. - A healthy glow in the skin, shiny eyes, a tendency to have a beaming smile, and an ability to be more aware of subtle nuances in the goings on around in everyday living. A tendency to be more conscientious human beings. - With such 'treatment,' being present, sensitive, aware, insightful, enlightened and harmonious becomes the normal and walking the path of truth and happiness effortless. A tendency to value-add comes naturally. Altruism, as a healthy natural expression of a coexistent cultural organism, comes about from being mindful. - People tend to settle for nothing less than the best after a few sessions. Their sense of quality simply upgrades. It is as though their character simply refines. I have also noticed that they aim for higher, better things in life and start going in the direction of it as though they are optimized towards rolling along the path of their most inspiring goal. This would not happen unless there is a harmonious balance in their entire system and is in tandem with order and life itself. Their system would destabilize if not and disease would ensue. - People tend to ace their chosen field of work. It is as though the sessions have given them an advantage over others who haven't been through this work. They become refined people. - Newer perspectives and outlooks at Life emerges. Newer opportunities are seen where hitherto far there may have been obstacles perceived. With this emerges a Path that the person may want to pursue as their contributory R&D/vocational field that they wouldn't mind spending the rest of their lives inquiring about and contributing to the society with. ﻿You may book an appointment to have a Meristem Intelligence® Maintenance Therapy session by contacting Bitha Sadanandan via the contact details below or via the form and choose a date and time of your choice. The price of one session is Rs.2501 that lasts anywhere from 1.5 hours to 2.5 hours depending on what the client's system is ready and able to work through at a point in time. Students can have a session for the price of Rs.1001. Once a date and time is selected, to book an appointment, you would be required to pay the minimum of Rs.1001/- to the account number mentioned in the mail. The balance payment can be paid either via PayTM, UPI or cash after the session at the venue. Multiple appointments could be booked at once with a single payment and changes made accordingly (please see Rescheduling and Cancelation policy below). Once payment is received, you would get an SMS confirmation that the appointment is booked. Since sessions are on one-person-per-session basis, appointments need to be booked at least 24 hours in advance. Rescheduling appointments: The appointment date and time may be changed as required, provided the change is before 24 hours i.e. changes cannot be made within 24 hours of the date/time. If within 24 hours of scheduled appointment time, a cancellation charge will apply (please see below). You may email me or message me, and changes can be made depending on availability. Cancelation: You may cancel an appointment before 24 hours of the due date/time. If within 24 hours, you would be charged Rs.400 as cancelation charge due to logistical reasons. The cancelation fee may be paid either online or when coming in for your next appointment. Contact me and let's start getting BETTER!